Heat oven to 375°F. Spray 8-inch ovenproof skillet with cooking spray. In small bowl, mix ricotta cheese, 1/2 cup of the Parmesan cheese and the Italian seasoning; spoon and spread into skillet. Top with chicken, mozzarella cheese, pasta sauce and remaining 1/4 cup Parmesan cheese. Bake uncovered 30 to 35 minutes or until heated through and cheese is melted. Meanwhile, in 6-inch skillet, melt butter over medium heat. Stir in bread crumbs; toast 3 to 4 minutes, stirring constantly, until dark golden brown. Spoon bread crumbs over dip; serve with crackers or baguette slices. This is a great recipe to use up leftover chicken. 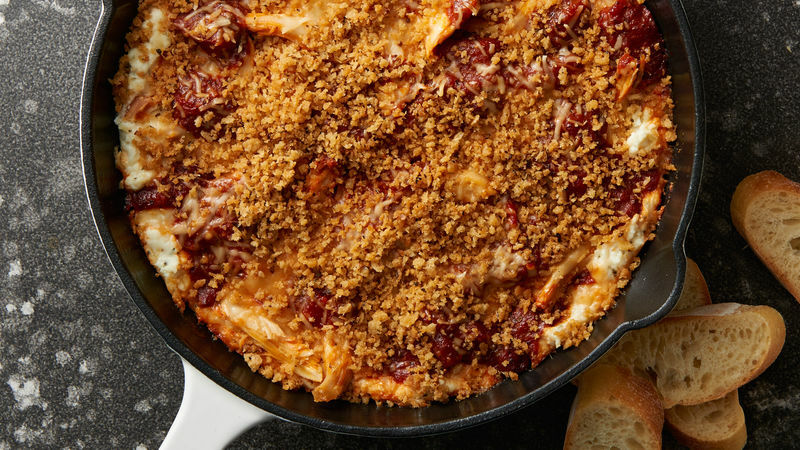 Toasting the bread crumbs in a skillet will ensure even cooking and a crunchy texture.